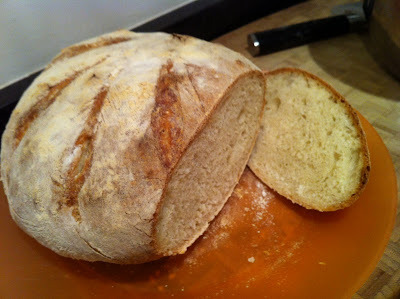 We usually buy our bread from the professionals and never really considered making it ourselves. While flipping through my favorite bakebook by Joanne Chang, I stumbled upon the perfect recipe for a rustic bread. The pictures were inspiring and the ingredient list was short, so I decided to give it a try. Although the process was very simple, it does require a lot of time and patience, the latter of which I severely lack. 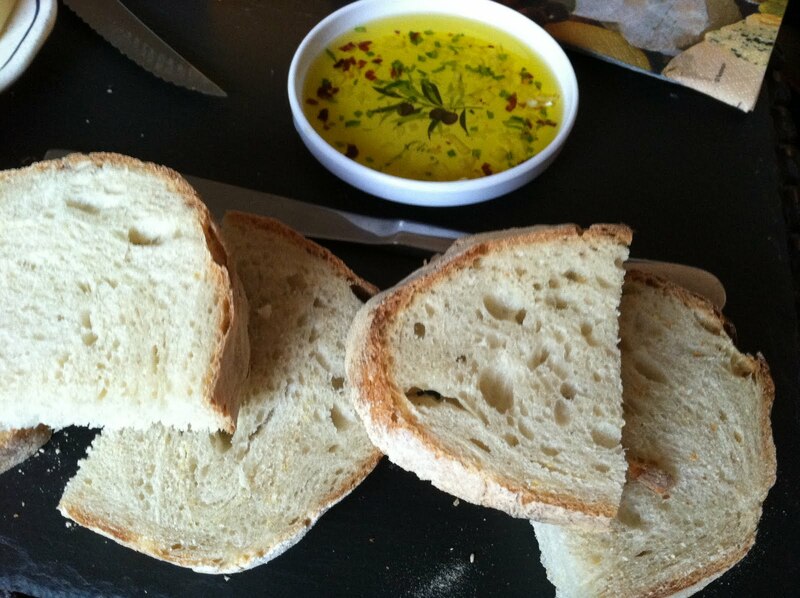 This loaf is perfect for pulling apart and dipping in olive oil, or slicing and spreading with butter. It tastes just as good as it looks. Make it for your next dinner party...I guarantee you will impress your guests! You'll notice that the recipe below includes weight measurements. Chang impressed upon my parents (who attended her book signing) that weighing ingredients is a key step in baking. Chuck recently purchased a digital scale to measure out his brewing ingredients and have since commandeered it for baking. I must agree that when it comes to baking, weighing makes a difference. This bread begins with a Bread Sponge. The sponge is actually many wild yeast spores that feeds off flour and adds a ton of flavor to the bread. That's right, it's alive! Stir together water, 1 cup (140 grams) of flour and yeast in a mixing bowl. Cover the bowl with plastic wrap and let it sit on the counter for 4 hours. Stir in 1/4 cup (35 grams) flour until the sponge has the consistency of a loose dough. Cover the bowl again and put it in the refrigerator overnight. 1. Mix together the water, 2 cups (280 grams) flour, and bread flour on low speed for a minute using the dough attachment. Cover the bowl with plastic wrap for 10 minutes at room temperature. 2. Remove the plastic wrap and add the bread sponge (recipe and directions above), salt, sugar, and yeast and mix on medium-low speed for a few minutes until the dough is smooth. 3. Drizzle a tablespoon of olive oil in a medium size bowl. Transfer the dough to this bowl, making sure all of the dough gets a nice coat of oil. Lay a damp paper towel over the dough and let it sit on the counter for 3 hours (make sure it is not sitting next to an air conditioning unit). 4. Grab some extra flour and spread it over your work surface. 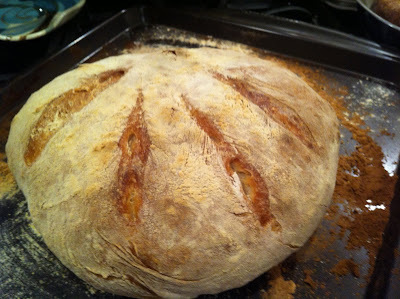 Put a little flour on your hands to prevent the dough from sticking. Remove the dough from the bowl and divide in half. Shape each half into a ball by tucking the edges underneath. 5. Unfortunately, the waiting game is not over yet. Sprinkle a light layer of corn meal on a cookie sheet, lay the loafs a few inches apart, and cover loosely with plastic wrap. Yup, wait another 3 hours (room temperature). 6. Place a shallow pan with water in it on the bottom shelf of the oven. Preheat the over to 500 degrees F. Cut slits into the top of the dough with a sharp knife and place the pan in the oven. Bake for 35-45 minutes (depending on your oven). Let the bread cool for a bit and serve with some olive oil or butter. **NOTE: If you don't have enough people over to eat both loaves, wrap one of them tightly with plastic wrap and place in the freezer for up to 2 weeks. Your post is full of delicious food. your recipe is very tasty and yaaammy. Thank you for your delicious post.